If you work in an office, chances are you sit over 8 hours a day. Most of us do more sitting than any other single activity and it is bad for our health. To make matters worse, when you punch out, what happens? Our commutes have gotten longer so we get up from our office chair only to sit in our car. Worse still, we end our day in our easy chair sitting in front of our flat screen TVs, or going online. The human body was not designed to sit down for 12+ hours per day, but that is exactly what we are doing every day. Shocking new studies reveal that prolonged sitting will put you in an early grave. When you sit down, your body becomes lethargic and lazy. The more you sit, the more harm you do. Doctors say prolonged sitting is the “new smoking” and can lead to Heart Disease, Obesity, Diabetes and even Cancer. Is it any wonder that America is losing the battle of the bulge? Dr. Alpa Patel, Epidemiologist "Our study (for the American Cancer Society) suggests women who sat for more than six hours a day were 37 percent more likely to die prematurely... So the bottom line is get up and stand." So if too much sitting is the problem, then the solution is obvious: Stand Up more. But most of us can’t quit our jobs to become a Forest Ranger. And we certainly can’t stand up while driving. Since most of our sitting is done at work, we need to ditch our office chair. 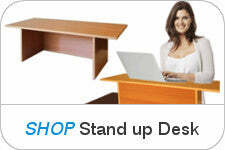 Most standing desks force you to stand up all day long. This is too harsh a transition for most of us. What’s worse is that you have to buy a whole new desk for hundreds of dollars, that isn’t portable and requires space that you just don’t have. And a fully adjustable hydraulic lift model that lets you sit or stand at the same desk can cost $2,500 or more. But get this, standing up all day is not the ultimate solution either. Experts now recommend a regimen of “postural rotation”, or simply switching between sitting and standing during your work day. So where can we find this magic solution? Pop-Up Desktop to the Rescue! Solid construction includes no-slip feet and a super-durable work surface. Hidden space below is perfect for holding supporting files or your next project, keeping your desk clean. The Pop-Up Desktop is the only stand up desk that can do this. When you want a sitting break you just move the stand and you have your old desk back. Now watch this. If you don’t have the room to store your Pop-Up Desktop, simply collapse it for easy storage. Just loosen the thumbscrews, fold in the sides, fold down the back and secure it in the folded position. It easily slides behind a door or file cabinet. What do Pop-Up Desktop Users say? Who should use the Pop-Up Desktop? Professionals- Lawyers love the stand because they think more clearly. Students– kids are naturally restless and standing lets their young minds work at peak efficiency. Standing is recommended by ADHD clinics. Back Pain Sufferers- relieve the pain of slumping all day in a chair. Love Handle wearers- WSJ reported "taking breaks from sitting helps trim waistlines and reduce heart disease". Lethargic or distracted workers- Turbo charge your output by letting you blood flow freely. Your production will skyrocket. Find out why the stand up craze is sweeping the nation. You can get these benefits by making one simple change. We have made it super easy for you to try standing up at work.